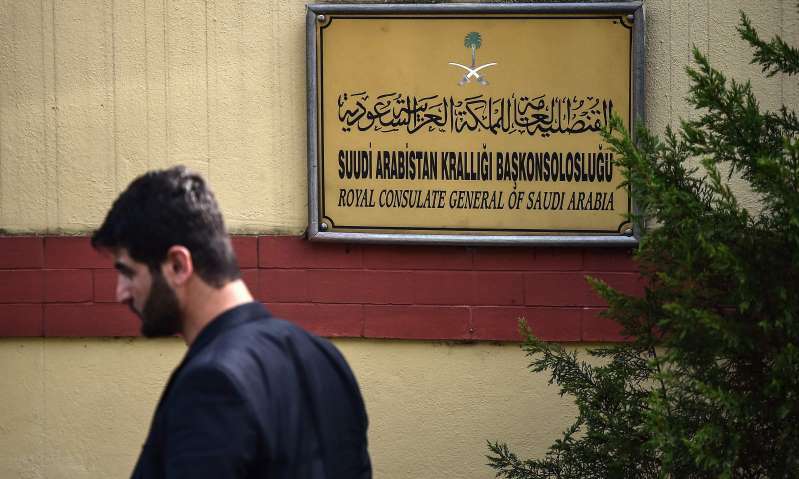 © AFP/Getty Images The Saudi Arabian consulate in Istanbul. Investigators have been trying to determine whether Khashoggi’s remains could have been dissolved in acid. The body of the journalist Jamal Khashoggi was “dissolved” after his murder and dismemberment at the Saudi consulate in Istanbul, an adviser to the Turkish president has said. “We now see that it wasn’t just cut up, [the Saudi suspects] got rid of the body by dissolving it,” Yasin Aktay, an adviser to Recep Tayyip Erdoğan and an official in Turkey’s ruling party, told the newspaper Hurriyet on Friday. The remarks represented the first official statement from a Turkish official about what allegedly happened to Khasoggi’s body. Turkish investigators have been trying to determine whether Khashoggi’s remains could have been dissolved in acid at the nearby consul general’s house. An unnamed official also told the Washington Post “biological evidence” in the consulate’s garden suggested that because of acid “Khashoggi’s body was not in need of burying”. Cars that travelled between the consulate and the consul general’s residence on the day of Khashoggi’s death spent about three hours in the garage under the property before moving on again. Turkish police have traced at least one vehicle to Belgrad forest, north of Istanbul, later that night. The journalist’s body has still not been found a month after his disappearance on 2 October, when he entered the consulate to obtain marriage papers while his fiance, Hatice Cengiz, waited outside. Saudi Arabia previously said that his intact remains had been wrapped in a rug and disposed of by a “local collaborator”, although the Saudi attorney general, Saud al-Mojeb, walked back that claim in talks with Istanbul’s chief prosecutor this week. Aktay’s statement comes after the first official acknowledgement from the Istanbul chief prosecutor, Irfan Fidan, on Wednesday that Khashoggi’s body was “dismembered and destroyed” after his death at the hands of a team of Saudi officials who flew in from Riyadh to kill him. Much of the information pertaining to the case has already been leaked to Turkish media, but the strengthening of Turkey’s official position suggests that Ankara is unwilling to let up on rivals in Riyadh in the search for answers in Khashoggi’s death. Saudi Arabia has attracted international opprobrium for its handling of the case. Riyadh initially denied it had anything to do with Khashoggi’s disappearance but then changed its story several times, first claiming Khashoggi died in a fist fight before admitting Turkish evidence suggested his killing was premeditated. The affair has created Saudi Arabia’s worst diplomatic crisis since 9/11 and sullied the reputation of the crown prince, Mohammed bin Salman, whom it is alleged must have been aware of the murder plan. It emerged this week that the prince called Khashoggi a “dangerous Islamist” in a phone call with Jared Kushner, the White House adviser and son-in-law to Donald Trump, just before Turkish police said they believed the missing journalist was dead.